If your cat has crystals in his urine, he's got crystalluria. There are different types of crystals, each with its own cause. 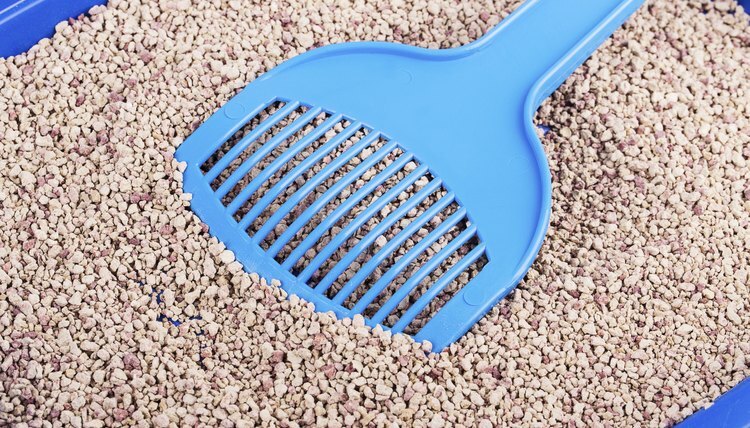 Struvite crystals tend to form because urine is too alkaline, oxalate crystals are associated with acidic urine and urate crystals, which are rare in cats, are linked to acidic urine or some liver diseases. Your cat may have called your attention to her painful urinary condition when she peed outside her litter box. The different crystals take on unique appearances in fresh urine, allowing the vet potentially to determine what type of crystals your cat has. Struvite crystals are made of ammonium, magnesium and phosphate, and tend to develop in alkaline urine. Eating a low magnesium diet can result in alkaline urine. Oxalate crystals are more common in cats, often occurring when the urine's acidic and there are high levels of calcium in the blood. Too much protein, calcium, vitamin D and sodium, as well as Cushing's disease, hyperparathyroidism and some cancers, can promote oxalate stones. If a cat has urate crystals, associated with acidic urine, chances are she has some form of liver disease. Urine crystals are no joke, potentially leading to stones; urine stones can block the flow of urine, which can have fatal consequences. A cat with urine crystals often needs a change in diet, though that won't guarantee the crystals won't return. Treatment also may include surgery or urohydropropulsion, where the anesthetized cat's bladder is flushed with saline, forcing the stones out. Increasing a cat's water consumption helps to minimize the formation of crystals because the urine is less concentrated and in the bladder for a shorter amount of time.